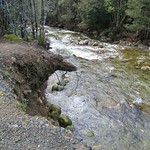 Mother Cummings Rivulet flows out of the mountains southwest of Meander, Tasmania. 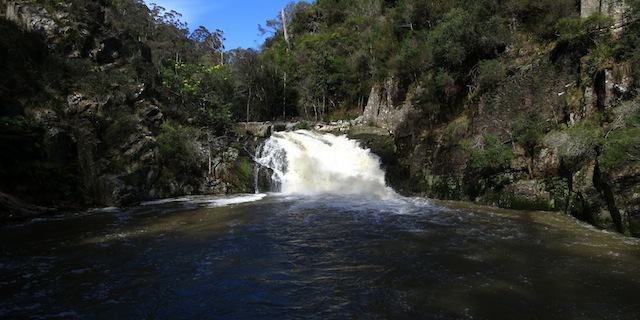 Following the rivulet upstream leads to Smoko Falls, and eventually to Cummings Head. 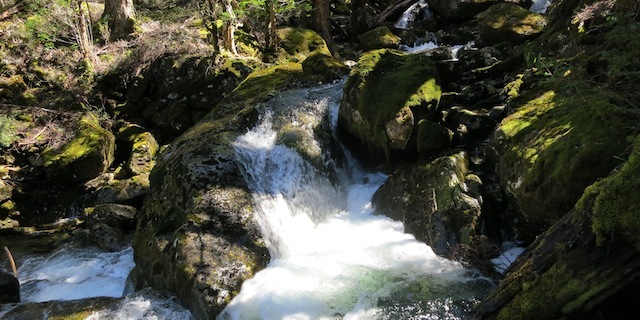 The track to Chasm Falls is also in the area. 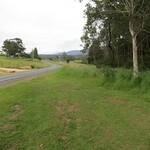 Drive to Meander, then turn south along Huntsman Road. Turn right onto Meander Falls Road. 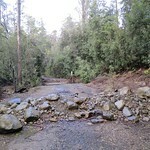 Avoid the bridge to Meander Falls; you are now on Smoko Road. 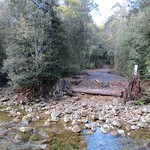 Follow that to a small turning circle and a sign pointing to “Chasm Falls”, “Smoko Falls” and “Mother Cummings Peak”. 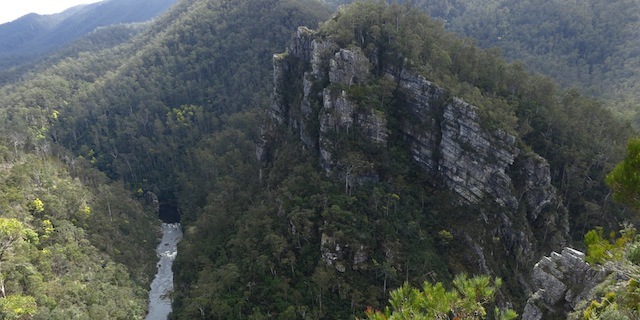 The track to Tulampanga Alum Cliffs is one of Tasmania’s Great Short Walks. 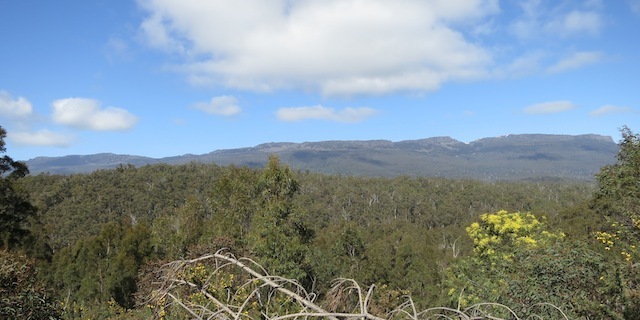 Less than an hour’s round trip takes you to a lookout where the Mersey River flows through a spectacular gorge. 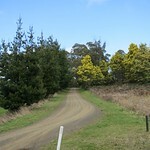 The car park is on Mersey Hill Road, a short distance east of Mole Creek. Mersey Hill Road is unsealed, but wide and solid. The route is clearly signposted. As noted in the comments, it is possible to walk into Sensation Gorge itself but not from the quarry described here. 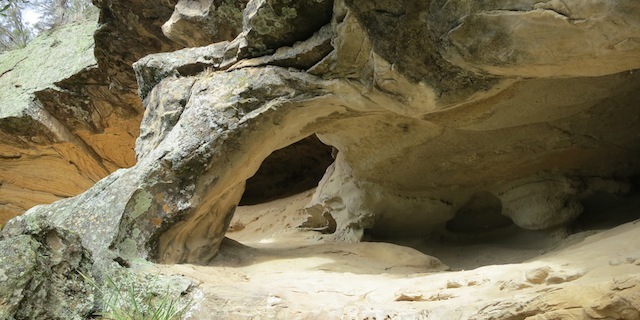 To enter Sensation Gorge, start from either parking further west along Liena Road, or from Union Bridge Road. 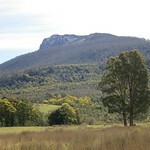 Apart from its famed National Parks, Tasmania has hundreds of smaller Conservation Areas and other reserves. 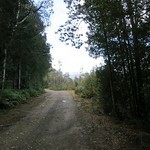 You can be driving along a road and see a car park, a sign saying “Sensation Gorge Conservation Area” and a track. You search for that name, and find a single line Parks & Wildlife Reserve Summary Report confirming its existence, and nothing else. (Many other sites claim to have information, but turn out to have nothing but the latitude and longitude, scraped from some existing map and displayed with advertisements.) The only way to find out more is to walk up the track – so we did. 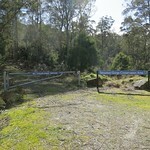 The car park is a short distance west of Mole Creek, on Liena Road. 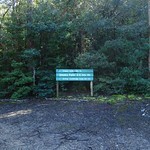 Look on the north side of the road for the “Sensation Gorge Conservation Area” sign. Lobster Falls is comprised of two cascades in the Lobster Rivulet as it passes through the Gog Range, Tasmania, Australia. 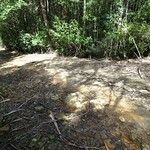 The good news: you can drive to the start of the Lobster Falls walking track without leaving a sealed road. 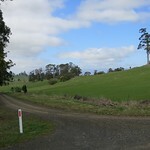 It’s on the road between Deloraine and Chudleigh, within an hour’s drive of Launceston. 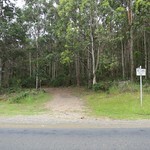 The bad news: the “car park” is a grassy patch next to the road, marked by a single signpost. Watch out for mud, especially if you’re visiting after rain to see the falls at their best.